The Global Labour Research Centre is pleased to announce its upcoming third annual International Graduate Student Symposium, to be held at York University on February 21-22, 2019. The Symposium will showcase research by emerging scholars on a wide range of issues related to the study of work and labour in a global context, and offers an interdisciplinary forum for graduate students and post-doctoral fellows to share their research in a collaborative and supportive environment. Dr. Susan M. Hill, Wolf Clan, Mohawk Nation, Six Nations of the Grand River works at the University of Toronto jointly appointed as the director of the Centre for Indigenous Studies and Associate Professor in the Department of History. In 2017, Dr. Hill published “The Clay We Are Made of: Haudenosaunee Land Tenure on the Grand River” (University of Manitoba Press), which won the Best First Book Award, Native American Indigenous Studies Association (2018). Dr. Hill’s research focuses on Treaty Rights, Haudenosaunee History, Indigenous Women, Indigenous Territoriality, and Indigenous Research Methods specifically Haudenosaunee. Accessibility: Accessible space. Wheelchair-accessible and gender-neutral bathroom nearby. Coffee and tea provided. Everyone welcome. Canada is a nation of immigrants, and it comes as no surprise that many Canadians share more than one homeland. For many Filipinos, family members living and working overseas is commonplace, and yet the strain of being apart is never easy. When your heart is torn between two places you love, how do you find your piece of paradise? The film captures the everyday life of Norlyn, Em-Em, and Betsy as they navigate living and working in Toronto while dreaming of the day they can visit the Philippines again. Their struggles are real but the women are resilient, knowing that their faith, community and especially their sense of humor will help them through the challenges. Co-sponsored by: The Department of Dance, the Centre for Refugee Studies (CRS), and York Centre for Asian Research (YCAR). very achievable changes in our workplaces and families, in the ways we raise boys to be men and dismantle rigid gender binaries, and in the movement to end men’s violence will bring significant rewards to communities all around the world. Michael Kaufman is the cofounder of the White Ribbon Campaign―the largest international network of men working to end violence against women―and for decades has been an advisor on gender equality to the United Nations, governments, NGOs, schools, and workplaces around the world. With honest storytelling, compassion, and hard-hitting analysis, The Time Has Come is a compelling look at why men must take a stand in the fight for general equality. Co-Sponsored by: The School of Gender, Sexuality and Women’s Studies and the Department of Sociology. Women's centres across Ontario have received funding from the Province for more than 25 years. Current funding agreements will end on March 31, 2019. NYWC and our sister centres have received no communication as to what will happen to this funding come April 1st. We know that you value the work that is done by North York Women's Centre - and all Ontario women's centres - to support women in local communities. We are asking you to help ensure this work continues by writing to your MPP - and encouraging others to do so. Please email iris@nywc.org for a copy of the letter template and a lit of MPPs and their contact details. The letter has been sent by women's centres have sent to Hon. Lisa McLeod, the Minister Responsible for Women's Issues. We are asking you to share this letter with your MPP along with a note explaining why you value NYWC's work and, if you are comfortable doing so, sharing a personal story of how NYWC has helped you or someone you know. We urge you to write to your MPP today and follow up with a phone call. We have highlighted contact details for Faisal Hassan (the MPP for York South-Weston, where NYWC is located), Andrea Horwath (the leader of the opposition) and Hon Lisa McLeod herself. We ask that you send a copy of your email to them as well. NYWC has scheduled a meeting with MPP Faisal Hassan to discuss this important issue. On behalf of everyone who cares about women's centres, I thank you for your support and urge you to take action to ensure that the vital services provided by women's centres continue to be available to women in Ontario. Library and Archives Canada, the Ottawa Public Library, the Ottawa International Writers Festival and McGill-Queen’s University Press invite you to the launch, hosted by Charlotte Gray, of Ladies, Upstairs! My Life in Politics and After by Monique Bégin. For more information about this event, call 613-996-5115 (1-866-578-7777) or email bac.marketing.lac@canada.ca. Seating is limited, so please register. (Toronto, ON - January 29, 2019) TO Live, in association with Native Earth Performing Arts and The Theatre Centre, presents the Toronto debut of Pour, from provocative, boundary-busting dancer-choreographer Daina Ashbee. Pour will be performed at the Theatre Centre (1115 Queen St. West) February 22–24, 2019. Tickets are on sale and available online at theatrecentre.org, by calling (416) 538-0988 or in person at the Theatre Centre box office. Recognized as one of the most promising choreographers of the next generation, Daina Ashbee was named one of “25 to Watch” by the influential American publication Dance Magazine. She is a Montréal-based artist, performer and choreographer. Her work is often influenced by her Cree, Métis and Dutch heritage and her experiences as a young woman, using both contemporary and traditional means as expression. With artistic direction, concept, choreography and scenography by Daina Ashbee and interpreted by Paige Culley, Pour is a work that explores the vulnerability and strength of women, uncovering the layers of pain they absorb in their bodies through a society that does not support them. Like her previous works, Ashbee has created a dark work that confronts its audiences. Yet, for the first time, layers of joy and celebration pierce the tension that has been manifested throughout the performance. Paige Culley’s courageous performance traverses states of liberation, control, pain, beauty and catharsis in a live and intimate setting. Special thanks to BMO Financial Group for its support of Pour, part of the 2018/19 Dance Collection. Daina Ashbee is an artist, performer and choreographer based in Montreal, known for her radical works at the edge of dance and performance, which intelligently approach such complex subjects and taboos as female sexuality, Métis identity, and climate change. For the choreographer, creation is an instinctive and quasi-spiritual quest, which embraces her relationship with her ancestors, the universe and the entire cosmos. At the young age of 26, she has already won two awards for her choreographies. She was a double prizewinner at the Prix de la danse de Montréal, winning both the Prix du CALQ for Best Choreography of 2015-2016 for her choreographic installation When the Ice Melts, Will We Drink the Water?, and the Prix Découverte de la danse, presented by Agora de la danse and Tangente, for Unrelated. Also Daina was named by the prestigious German Tanz magazine as one of 30 promising artists for the year 2017 and named one of 25 to watch by the American publication, Dance Magazine in 2018. Recognized as one of the most promising choreographers of the next generation, her work is regularly presented in the most prestigious festivals (The Venice Biennale, Oktoberdans, Les Rencontre Chorégraphiques de Seine Saint Denis, and the Munich Dance Biennale) and on the stages of the world (Canada, France, Spain, Belgium, Norway, Finland, Greenland, Germany, Italy, Switzerland, and Mexico). Daina is the artist-in-residence at Agora de la danse in Montreal until 2020 and the associate artist of Centre de Création O Vertigo - CCOV. In 2018, she will return to the Venice Biennale to create her first full-length group piece. She will continue to tour in Norway, Belgium, Italy, Czech Republic and Canada meanwhile creating a new solo and a group piece set to premiere in 2019 and 2020 respectively. Paige Culley, originally from Rossland, British Columbia, entered the professional training program at the School of Toronto Dance Theatre, where she was awarded the Hnatyshyn Developing Artist Grant for contemporary dance. Upon graduation in 2010, Culley worked as part of Dancemakers, performing work by Antonija Livingstone, Martin Belanger and Ame Henderson. Residing in Montreal since 2011, Culley performed extensively as part of Compagnie Marie Chouinard, and continues to work with Le Carré des Lombes as well as with independent artists including Daina Ashbee, Doris Uhlich, and Marten Spangberg. In 2012, Culley represented Canada in the “danceWEB” scholarship at ImPulsTanz, in Vienna, Austria. Additionally, Culley has worked in film and musical theatre, and over the past 10 years as a guest teacher throughout Canada and the United States. Classes led by Culley range from classical modern and contemporary technique, to sensorial and repertoire based company master classes, as well as experimental and inclusive “soft punk” which was offered as part of Toronto Love-in’s 2014 “making space” teaching directive. In 2017 she received the Prix DÉCOUVERTE at Prix de la danse de Montréal. The Theatre Centre, 1115 Queen St. W.
Single tickets $33 (service changes may apply). All tickets are available for pick-up at the theatre two-hours before the performance. Please note that latecomers will not be admitted and The Theatre Centre is not able to offer refunds. Native Earth Performing Arts is Canada’s oldest professional Indigenous theatre company. Currently in its 36th year, Native Earth is dedicated to creating, developing, and producing professional artistic expressions of the Indigenous experience in Canada. Through stage productions (theatre, dance, and multidisciplinary art), script development, and apprenticeships, Native Earth seeks to fulfill a community of artistic vision that is inclusive and reflective of the Indigenous community who actively participate in the arts. Time and place are elusive qualities in Yam Lau’s video work, Rotation: In the texture of the world. Dislodging the moving image from a spatio-temporal logic, Lau builds a dimensional palimpsest where history and contemporary coverage, and location is unfixed, with the architectural features of the site moving in and out of register, never quite aligning. Twinning an ancient folk tale about a hidden civilization with the plight of a contemporary urban village out of step with an encroaching mega-city., Lau suggests that its discovery is less reliant upon mapping than turning to its unique frequency in the world. Yam Lau’s creative work and research explore new expressions and qualities of space, time and image. His most recent works combine video and computer-generated animation to re-create familiar spaces in varied dimensionalities and perspectives. In addition to his new media work, he is actively involved in the local art community. Certain aspects of his practice, such as using a donkey as an on-going mobile project space in Beijing, China are designed to solicit community participation. The recipient of numerous awards from the Canada, Ontario and Toronto Arts Councils, Professor Lau has exhibited widely across Canada, the US and Europe. He also publishes regularly on art and design. Abstract: In this paper I place Frantz Fanon’s brief comments on atmosphere in conversation with more recent efforts to theorize affect through the ephemeral, mutable, and material impress of atmosphere. In so doing, I initiate a close reading of Fanon’s essay, “Racism and Culture” alongside his better known and more widely read The Wretched of the Earth. Here, I consider Fanon’s reflections on the psycho-affective traumas of colonialism, racism, and colonial violence through affective registers rather than the more conventional and established psychic ones. In so doing, my objective is not to recuperate an authentic Fanonian voice. Nor is it to dispute the phenomenological and psychoanalytic readings of Fanon that have been so influential in postcolonial studies, critical race theory, and beyond. Rather, my goal is to consider how Fanon’s remarks on atmosphere might be reworked and expanded toward an affective and nonanthropocentric account of race. 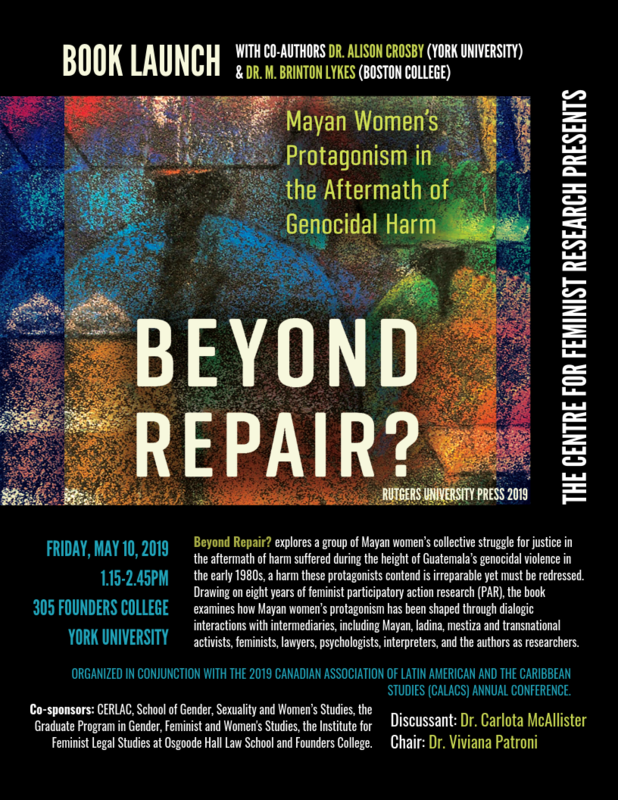 Renisa Mawani is Professor of Sociology and Chair of the Law and Society Program at the University of British Columbia. Her numerous publications include Colonial Proximities (UBC Press, 2009) and Across Oceans of Law (Duke University Press, 2018). For more information, contact Summaiya Zaidi at SummaiyaZaidi@osgoode.yorku.ca. Learn more about the York Centre for Asian Research at www.yorku.ca/ycar. The Jean Monnet Centre of Excellence (JMCE) housed at the Centre for European Studies at Carleton University is excited to announce the International Emerging Scholars' Workshop "Migration, Identity and Politics in Europe" taking place on Friday, March 1, 2019, from 8:30AM to 5:00PM. About the Event: Migration has played a central role in constituting Europe and facilitating European integration and identity. Most Europeans have experiences of migration in their own family histories. Yet, across Europe, we see the term “migrant” employed in public discourse as code for “foreigner” standing in opposition to “European.” In recent years, few issues have been more divisive and politicized in European politics than responses to the challenges of migration and refugees. This workshop will illuminate the nexus between migration, identity and politics in Europe. Exploring historical and current cases drawing on disciplinary approaches from history, political science, anthropology, cultural studies, sociology and geography, this event will showcase new perspectives and approaches to European migration studies from international emerging scholars and graduate students. We, the Socialist Feminist Working Group members of Philly DSA are organizing the Socialist Feminist Convergence, taking place in Philly April 26-28, 2019! This will be the first meeting of socialist feminist activists since the recent rise in support for socialism in the US. We invite you to submit proposals for the program, which will run from Friday evening to mid-day Sunday. Suggest a theme, or question you hope to answer, or offer a concern for us to consider as we plan. We invite proposals for speeches, workshops, panels, or skill-shares. We invite you to present on your successes, or the challenges you think we need to learn from. Sessions will be roughly 15 minutes, 35 minutes or 75 minutes long, and will not necessarily require circulating any materials in advance. If you only have enough material for a shorter period of time, please let us know how long you’d like. Please indicate if you will need any technical support (PA, Projector). We will also be able to support printing of some materials, so please try to specify any needs for handouts, packets, worksheets or visual aids. Anyone is invited to submit a proposal, regardless of organizational status. You can propose a panel session with a few (3-5) speakers and facilitator for a discussion on a subject or you can propose a shorter individual component that we will match with others for a larger sessions. Please submit proposals by February 20 for full consideration. Consult the link or read the Call for Proposals (https://drive.google.com/file/d/11_Za2T89XO2vGp82JwiTbfiIXeJ6v0Nh/view)for more details. Proposals received by February 20 will receive first review. The event itself will be free, but we are raising money to cover costs of space rental, keynote speakers, and materials. Please help us to boost our signal by forwarding, sharing, tweeting @phillysocfem, and liking or going directly to our Go Fund Me fundraising campaign. MADRE is an international women’s human rights organization that works towards a world in which all people enjoy the fullest range of individual and collective human rights; in which resources are shared equitably and sustainably; in which women participate effectively in all aspects of society; and in which people have a meaningful say in decisions that affect their lives. To apply, send resume and cover letter to mcrawford@madre.org. No phone calls, please. MADRE, Inc. is an equal opportunity employer. Prospera’s Program Officer Asia and the Pacific supports in the implementation of Prospera’s Institutional Strengthening program, with a particular focus on resource mobilization/local fundraising, communications, and technology and information systems, including digital security. S/he supports and ensures the execution, adherence and compliance of Prospera’s mission. S/he will be liaison with the Asian members of Prospera. Prospera’s Institutional Strengthening program supports member women’s funds to develop critical structures and strategies they need to be sustainable and thrive. The program takes a holistic approach to organizational development and is created in partnership with member funds at all levels. A critical component of this program is dedicated to supporting women’s funds develop effective strategies to mobilize greater resources, communicate effectively, and develop new funding partnerships. Work collaboratively with other team members to develop and define Prospera’s Institutional Strengthening Program strategies. Lead the Institutional strengthening work with Prospera members on resource mobilization, communications, information technology, and digital security. Lead the design and implementation of the Resource Mobilization Learning Community for all network members. Identify, build, and manage relationships and networks with member funds, stakeholders, and civil society actors and government bodies, in coordination with the Deputy Director. Provide technical assistance and advice to member funds on an ad-hoc basis, particularly those in Asia and the Pacific. Passion for and solid knowledge of women's human rights and gender equality issues globally and particularly in Asia. At least 7 years experience in women’s human rights, philanthropy, social entrepreneurship, development, or related field, ideally with women’s rights organizations in Asia and the Pacific. Masters degree in gender studies, international relations, or related field is strongly preferred. Demonstrated ability to work virtually. Please send an updated CV, Cover Letter and two writing samples to Alexandra Garita, Deputy Director at agarita@prospera-inwf.org by February 15, 2019. APWLD is inviting women from across Asia-Pacific with relevant experience and skills to submit their expression of interest for the consultancy for APWLD Mid-Term Evaluation. Please read the Terms of Reference below. To review the effectiveness of APWLD’s organisational structure (e.g. membership committees) as a membership-driven network in advancing its goals and objectives. To review the implementation of previous recommendations and provide further recommendations to ensure our work continues to be effective, influential and beneficial to our movement. APWLD is Asia Pacific’s leading feminist, membership driven network. Our membership represents diverse women from 27 countries in the region and provides the strength and expertise that both drives and executes our programmes. For over 32 years APWLD has been empowering women to use law as an instrument of change for equality, justice, peace and development. We use capacity building, research, advocacy and activism to claim and strengthen women’s human rights. The evaluation should also assess whether there have been unexpected outcomes (positive or negative) of APWLD’s work, the impact of APWLD’s work on backlash or erosion of women’s human rights. The evaluation should assess whether APWLD’s organisational structural is enabling members’ participation and reflects APWLD’s membership-driven nature. It will contribute particularly to understanding the relationship between APWLD’s impact and organisational structure. The evaluation should provide a summary of the political and social context that APWLD works with particular reference to globalisation, militarisation and fundamentalisms. In addition the evaluator will be asked to review APWLD’s previous external evaluation and comment on the extent to which those recommendations have been implemented and the impact of those changes. Capacity to travel within the region and meet tight deadlines. Review key documents including strategic plan, programme reports, member reports and surveys. Conduct collective and individual consultations with governance members, broader members, programme members and staff involved in programme delivery. Identify key areas of focus for the evaluation (note that the broad nature of APWLD’s work may necessitate more focused impact evaluation around 3-5 key initiatives). Share preliminary methodologies, findings and conclusions with APWLD Secretariat and Programme and Management team prior to finalising the report.ations should be focused on both programmatic potential and potential to broaden APWLD’s member engagement and movements. Experienced evaluators are invited to submit a short proposal and personal resumes for the following consultancy. Consultancy fee will reflect competitive rates payed within the region. Travel costs to APWLD activities will be borne by APWLD and need not be included in the proposal. Please send your proposals via email to Ms. Kim Nguyen, Programme and Executive Associate at kim@apwld.org. Since 2015, medica mondiale has been implementing programmes and projects in the Kurdish Region of Iraq focusing on strengthening local protection and counseling for women and girls affected by sexual and gender based violence. The Expert is responsible for contributing Trauma-expertise to the projects implemented by medica mondiale in KRI. In close cooperation with the medica mondiale technical advisors on trauma work in Cologne, the Trauma Expert ensures the implementation of the projects in KRI according to medicamondiale standards on trauma work. The position reports to the Head of Mission in KRI. The Women's Legal Education and Action Fund (LEAF) is a national non-profit organization dedicated to advancing the equality rights of women and girls in Canada through litigation, law reform and public legal education. For more than 30 years, LEAF's work has influenced the evolution of constitutional equality principles in Canada and made an important difference in the daily lives of women and girls across the country. LEAF recently streamlined its leadership to create the position of Executive Director & General Counsel, aligning responsibility for operations more closely with legal programming. We are looking for a new leader to fill this position. The ideal candidate is a dynamic, visionary lawyer with deep roots in the feminist community. She has a background demonstrating the skills necessary to provide leadership on all aspects of LEAF’s work, including human resources, fund development and financial management, as well as LEAF’s important legal work. She is an effective communicator capable of representing LEAF to the donors, funders, government departments and partners that are central to LEAF’s success. She will strengthen LEAF’s relationships with its branches and their members across the country. She will be accountable to and work closely with LEAF’s volunteer Board of Directors. She will lead a strong staff team, based in LEAF’s new offices in downtown Toronto. Compensation: Salary range: $117,500 – 130,000. LEAF offers a competitive benefits package and is committed to excellence as a workplace. How to Apply: LEAF encourages applications from candidates who reflect the diversity of our communities. Applications will be accepted by email only. In the subject line of your email application, reference “ED & GC” and your name. Please submit the following as a single attachment: your cover letter, your curriculum vitae and a list of three employment references (contact name, phone number and email address), addressed to executivehiringcommittee@leaf.ca<mailto:executivehiringcommittee@leaf.ca>. Do not submit multiple applications or send additional documents. Applications will be accepted until noon (Eastern) on February 25, 2019. We anticipate interviewing during the week of March 4, and hope to have our new leader in place by April 1st. We thank all applicants for their interest, but only candidates selected for an interview will be contacted. No telephone enquiries please. For more information about LEAF, please visit our website at https://www.leaf.ca<https://leaf.us10.list-manage.com/track/click?u=948eb06d0d00537fe844b6e9c&id=191f75a88b&e=6537b9198b>. St. Thomas University invites applications for the Endowed Chair in Human Rights, at the rank of Assistant Professor, to begin August 1, 2019, pending budgetary approval. This appointment will be for a twenty-three-month term, with a possibility of renewal. St. Thomas University is an undergraduate, liberal arts institution with full-time enrolment of 1,800. Its students graduate with Bachelor of Arts, Applied Arts, Education, and Social Work degrees. The faculty members are distinguished teachers, researchers and scholars, and the University holds four Canada Research Chairs. The successful candidate will have research and teaching expertise in human rights, and teach 3-3 per academic year. A PhD in Human Rights or related PhD with research in an area specific to human rights issues is required. In addition to teaching in the Human Rights Program, the holder of the Chair will conduct research in the area of human rights and undertake community-based seminars. Electronic submissions sent to cszurlej@stu.ca are preferred. Closing date: February 25, 2019 or until the position is filled. Applicants are responsible for ensuring that their completed applications, including letters of reference are received by this date. An equal opportunity employer, St. Thomas University is committed to employment equity for women, Aboriginal persons, members of visible minority groups, and persons with disabilities. All qualified candidates are encourages to apply; however, Canadians and permanent residents will be given priority. The Department of Politics, York University, Toronto is recruiting for an Assistant/Associate Professor and CRC in Politics of Democracy and Artificial Intelligence. The ad may be accessed via the link and document provided, and is also included below. We would appreciate your forwarding this message to potentially interested parties. Thank you. The Department of Politics, Faculty of Liberal Arts & Professional Studies at York University invites applications from outstanding early career researchers who specialize in Politics of Democracy and Artificial Intelligence for appointment as professorial tenure-track or tenured professor at the Assistant or Associate Professor level. Note that this appointment is contingent upon a successful nomination to the Canada Research Chairs program (http://www.chairs-chaires.gc.ca/) at the Tier 2 level. The start date for this position is July 1, 2019 or as soon as possible thereafter. The successful candidate must have a PhD in Political Science or a related discipline. The ideal candidate will be an emerging world-class researcher with demonstrated potential for international recognition in their field, and for taking a pioneering approach to the study of democracy and technology. The development of Artificial Intelligence (AI) poses a host of challenges to social and political life, many of which will have an impact on the struggle towards democracy. The core focus of the proposed Chair is the relationship between AI and the democratic governance of states and societies. This relationship bears on, but is not limited to: 1) the political control of residents (populations) bearing on migration, privacy, political expression, and, given emerging trends toward trans-humanism, who or what counts, in what ways, as a citizen or even human; 2) political and policy decisions about the organization of economies, the nature of work, consumption, and the environment; and 3) the very constitution of polities as it relates to the nature of states and the democratic body politic. The CRC in the Politics of Democracy and Artificial Intelligence will lead a research program into the democratic possibilities of AI, and the political demands for achieving greater democracy through the social disruptions and resources AI will produce. The successful applicant will be eligible for prompt appointment to the Faculty of Graduate Studies. Preference will be given to those with experience supervising graduate students and postdoctoral fellows and/or the potential to attract, develop, and retain excellent students and future researchers, while contributing to curricular development in their area of specialization. Pedagogical innovation in high priority areas such as experiential education and technology enhanced learning is preferred. The Canada Research Chairs (CRC) program seeks to attract outstanding researchers for careers at Canadian universities. Tier 2 Chairs are intended for exceptional emerging scholars (i.e., who, at the time of nomination, are within 10 years of attaining their highest degree, with consideration for career breaks) who have the acknowledged potential to lead their field of research. Appointment to a Tier 2 Chair is for five years, is renewable once, and comes with enhanced research support from the program. Applicants who are more than 10 years from their highest degree (and where career breaks exist, including maternity leave, extended sick leave, clinical training, etc.) may have their eligibility for a Tier 2 Canada Research Chair assessed through the program’s Tier 2 justification process. Please see the CRC website (http://www.chairs-chaires.gc.ca/) for further eligibility details. As a research Chair, a CRC is expected to develop research linkages within and beyond York. In the case of this Chair, productive research trajectories may include collaborations with scholars across the Faculty of Liberal Arts & Professional Studies, as well as a number of York’s Research Centres and Institutes (www.yorku.ca/research/about/centres.html). The deadline for applications is February 28, 2019. Salary will be commensurate with qualifications and experience. All York University positions are subject to budgetary approval. Applicants should submit a signed letter of application outlining their professional experience and research interests, an up-to-date curriculum vitae, a research and research leadership plan for the prospective Chair, a sample of their scholarly writing (maximum 50 pp. ), and a teaching dossier, and arrange for three signed confidential letters of recommendation to be sent to: Professor David Mutimer, Chair, Department of Politics, Email: polsjobs@yorku.ca (Subject line: CRC in Democracy and Artificial Intelligence). York University has a policy on Accommodation in Employment for Persons with Disabilities and is committed to working towards a barrier-free workplace and to expanding the accessibility of the workplace to persons with disabilities. If you require accommodation at any time during the hiring process, please contact Professor David Mutimer, Chair, Department of Politics at polschr@yorku.ca. Self-Identification and Work Status Declaration forms may be found at: http://acadjobs.info.yorku.ca/affirmative-action/. Applicants wishing to self-identify can do so by downloading, completing and submitting the form. A declaration of work status is required. The Professional Development Programme for Gender Trainers is receiving applications for the 2020 cohort! KIT Royal Tropical Institute and the UN Women Training Centre are pleased to announce that the PDPGT is now open to new registrants. The training includes different activities such as moderated on-line learning, remote monitoring of the participants' tasks, as well as two face-to-face workshops in KIT facilities in Amsterdam. The third edition will take place from 20 October 2019 until 24 April 2020, encompassing a total period of six months. The PDPGTs is the first of its kind! It aims to reposition training as a feminist-knowledge process to challenge and engender mainstream development and support the achievement of the UN’s Sustainable Development Goals. lanes and trails. Residents of Winnipeg have ample opportunities for leisure activities, including a multitude of parks and trails. The appointment will begin on July 1st, 2019, or as soon as possible thereafter subject to negotiation with the successful candidate. The successful candidate will declare that they self-identify as Indigenous, and preference will be given to those who trace their lineage to Indigenous peoples in Canada (e.g. First Nations, Métis, and Inuit). The University of Manitoba is strongly committed to equity and diversity within its community and especially welcomes applications from women, persons with disabilities, persons of all sexual orientations and genders, and others who may contribute to the further diversification of ideas. All qualified candidates are encouraged to apply. However, Canadian citizens and permanent residents will be given priority. The application for this position must include a letter of application, a curriculum vita, and three confidential letters of reference sent directly from the applicant’s referees. Candidates should also include a recent research paper and evidence of effective teaching, such as teaching evaluations or sample course outlines. Applications and confidential references should be sent electronically to ArtsWOMN.Reach@umanitoba.ca. The deadline for receipt of applications is March 22, 2019. Further information concerning the Departments of Native Studies and Women’s and Gender Studies may be obtained from http://umanitoba.ca/native_studies/ and http://umanitoba.ca/faculties/arts/departments/womens_studies/ . Application materials, including letters of reference, will be handled in accordance with the protection of privacy provision of The Freedom of Information and Protection of Privacy (Manitoba). Please note that curriculum vitae may be provided to participating members of the search process. UNDP and UNV commit to leaving no one behind. The Talent Programme offers an opportunity to work in the UN Development System. Their assignments may be with UNDP Country Office, Regional Hub or Headquarters. Through a year long assignment, young professional with disabilities will acquire practical work experience and get exposed to the UN Development mission. To be eligible to apply, candidates should be no more than 35 years of age, and hold a Bachelor or a Master’s degree, or be enrolled in a university programme at the Master level. Work experience will be an advantage but not a requirement.